Having issues with your Drive? Our certified Baldor technicians can help! "Repair Zone saved us from excessive downtime. Our machine was running, but not at optimal speed. OEM lead time was outrageous. The drive you sent us is running strong. Thanks!" Expert, Authorized Baldor Drive Repair, Everytime! We are proud to say several of our technicians are Baldor certified. As a result, we have a long history of success when it comes to Baldor drive repairs. 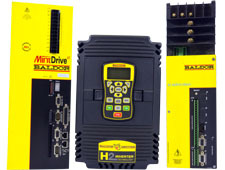 So, when your drive comes in for repair you can be confident it will be in the skilled hands of Baldor professionals who have full support from the OEM! Contact our customer service team today!